The United Nations Environment Programme (UNEP) has unveiled a brokerage service to promote cooperation in wastewater treatment between China and other developing nations. The service, Regional Hub of Global Wastewater Initiative for South-South Cooperation, which will be run by the China Beijing Environment Exchange (CBEEX), was launched in Beijing on Wednesday as a platform to help countries in need of wastewater treatment products find reliable manufacturers via a new website linked to en.chinagate.cn. The objective is to bring together countries with advanced wastewater treatment technology and those without for experience-sharing and technology transfer, as well as to mobilize resources from local authorities and the private sector. The CBEEX will also act as a guarantor for both sides. 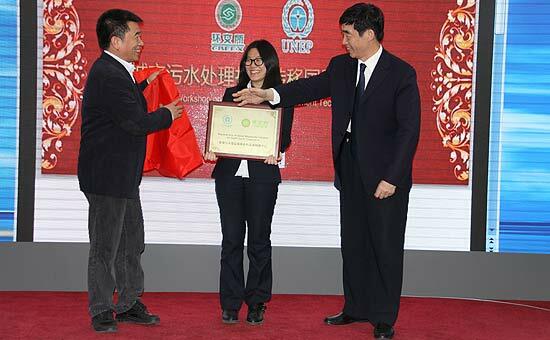 Zhang Shigang, the UNEP's representative in China, said at the launch ceremony that the organization has organized experts to survey wastewater treatment technology in more than 20 cities in China over the past year. In the same period, the UNEP carried out research in developing nations including in Africa to learn about their demand for wastewater treatment. In recent years, as urbanization accelerates and the population expands in developing nations, water pollution has come to pose a severe threat to health and the environment. A recent report jointly produced by the UNEP, UN-Habitat and the World Health Organization showed that only 20 percent of global wastewater is currently being treated, leaving low-income countries hardest hit by contaminated water supplies and disease. The new brokerage service is part of the UNEP's Global Wastewater Initiative (GW2I), announced in 2013 to try to improve the situation by urging international organizations, governments and private sectors to make joint efforts in preventing further pollution and damage. The GW2I is a global multiple stakeholder platform comprised of UN agencies, international organizations, governments, scientists, private sectors and Major groups and stakeholders to provide the foundations for partnerships to initiate comprehensive, effective and sustained programmes addressing wastewater management.